As a makeup artist, there is nothing I love more than going all-out and playing with every makeup product in my arsenal to give my clients gorgeous new looks. There really is nothing more exciting than taking a blank slate and turning it into a work of art with my hands and my brushes. However, I do confess that there are some days when I get clients who ask for a more natural look; I enjoy doing those too, it actually takes the same amount of work, but using a different colour palette. When I have clients who ask me why they should come to me for a natural makeup look when they can do it in their own, the only thing I usually say is that I have been trained to make sure their best features pop and make them look natural at the same time. Trust me when I say that “natural” makeup can look really unnatural in the hands of someone who does not know what they are doing. After all, just because something looks natural doesn’t mean it is easy. I have to confess that there are times when I find natural makeup looks to be more challenging than full makeup looks. It’s so easy to go overboard! Full makeup, on the other hand, is the type of makeup that you usually see on celebrities when they hit the red carpet. It means they wear full foundation, false lashes, eyeliner, eye shadow, contour, highlighter, and the works. For full makeup, the colors and lines are usually bolder and much more defined. Creating a full makeup look that is flattering and not clownish is a challenge but it’s so much fun. 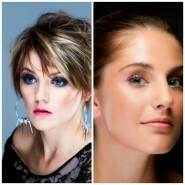 For natural looking makeup, you will want to wear light colors and allow as much of your skin to show as possible. If you have relatively good skin, you can even get away with just a light powder and concealer on your under-eyes and the sides of your nose to get rid of any redness and to even out your skin tone or tinted moisturizer or BB Cream. You want to make sure you choose a light, rosy blush that compliments your skin tone. For your eyes to look wide awake and fresh, you do not need to use false lashes. You may just apply mascara and curl your eyelashes, it is very popular today to use a color mascara such as blue/green/brown. A bit of highlighter to the inside corners of the eyes will not hurt either. Last but not the least, your lipstick—you will want to look for a nice MLBB (my lips but better) shade so that you look all fresh and natural. When it comes to full make up, the sky is the limit! You can be as daring and as bold as you want. Just remember to focus on one facial feature so that you do not look clownish. If you want bold eyes, then keep the rest toned down. If you want a bold red lip, you should use a neutral coloured blush.